In this magnificently illustrated and comprehensive book, readers will take one of the most beautiful journeys our world has to offer: an exploration of the greatest are and architecture of Western civilization. Art of the Western World-- the companion volume to the nine-part PBS television series -- traces the history of Western art from its classical roots in ancient Greece up to the present day and the international Post-Modernism of artists as diverse as Christo, Hockney, and Kiefer. Along the way experts Bruce Cole and Adelheid Gealt carefully chart the evolution of the Western tradition, from the grandeur of Roman architecture to the symbolic language of medieval art, through the unparalleled achievements of the Renaissance, the turbulent emotionalism of the Romantics like Turner and Constable, the Impressionists' search for a new reality, and the revolution of the Abstract Expressionists of the twentieth century. Art of the Western World integrates the works of each period with the history, values, and ideals that gave birth to them: the influence of the Medicis and other great patrons of Renaissance Italy; the resurgence of the classical style, inspired by the French Revolution; the break with the past evidenced in the works of the Impressionists; and the tortured visions of the modern world devastated by wars depicted in the paintings of Picasso, Marc, Groez, and others. A valuable key to understanding the language of art, Art of the Western World offers fresh insight into what the great works meant at the time they were created and why they maintain their special meaning to us now. 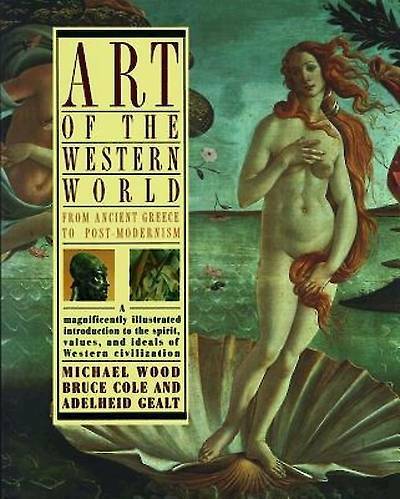 It is the perfect guide to the masterpieces of Western art.